The California New Car Dealers Association is suing TrueCar Inc., accusing the vehicle-shopping site of breaking California laws on dealer licensing, brokering, advertising and disclosure. The dealers association filed the 12-page lawsuit today in Los Angeles Superior Court. Because of TrueCar’s alleged violations, “both the consumer and new car dealers are not being protected,” the association said in a statement. The suit doesn’t seek monetary damages but asks that the court order TrueCar to comply with California law. TrueCar plans to “vigorously defend” itself in court and expects to be fully vindicated, according to Johnny Stephenson, TrueCar’s chief risk officer. The company has invested “tremendous resources” in ensuring it’s compliant with all laws and regulations, Stephenson told Automotive News. “These are not new issues, they’ve been bandied about for some time." The dealers association claims that TrueCar, based in Santa Monica, Calif., is acting as a dealer and a broker and is in violation of existing consumer protection laws because it does not have a dealer or an auto broker license. Patty Glaser of Los Angeles law firm Glaser Weil is representing the association in the lawsuit. The lawsuit asks for a court injunction restraining TrueCar from conducting business as a dealer or broker. “TrueCar's business activities bring it within the [California Vehicle Code] definition of ‘dealer,’ and TrueCar's failure to obtain a dealer's license is a violation of California law,” the lawsuit says, asking for a court declaration. If the court agrees with the association, TrueCar “would either have to be licensed, or they would have to stop doing business” in California, Glaser said. Maas called the move to file the lawsuit “extraordinary.” It is the first lawsuit filed by the association in the 13 years that he’s worked there, he said, and it came about because the association’s leaders have had concerns about the legal status of TrueCar for a long time. In 2012 and again in 2014, the association hired outside counsel to examine the legality of TrueCar’s business model. Those examinations concluded that TrueCar was acting as a dealer and broker, Maas said. But TrueCar says it has met regularly with the California New Motor Vehicle Board, the regulatory arm of the state’s Department of Motor Vehicles, to explain its business practices in California and make sure it is following all laws. The new vehicle board has taken no action against TrueCar for its practices, Stephenson said. Additionally, TrueCar has met with the association several times over its concerns, most recently in the fall of 2014. For instance, Maas said, California dealers using a broker are required to check a box on the sales contract and state the name of the broker. But he doesn’t know of any TrueCar dealers who are checking that box and listing TrueCar on their contracts. “We don’t want them to get in trouble either,” Glaser said. The association represents 1,100 dealers across California. Brendan Harrington, president of Longo Toyota in El Monte, Calif., said the problem many dealers have with TrueCar is that while it may be compelling from a consumer standpoint, it’s creating a “race to the bottom” for the buyer's experience at a dealership itself. “If you start a customer so far below invoice and cost, the only way to make that money up is doing things I hate,” Harrington said, including mark ups on interest rates or stealing trades below market value. Dealers also cringe at the idea of losing control of the customer’s data to TrueCar, Harrington said. Harrington acknowledged that car dealers as a whole share at least part of the blame for the rise of a service like TrueCar in the first place. But the industry can course correct to increase transparency as dealers work together to render TrueCar moot. This isn’t TrueCar’s first challenge over the legality of its operating model. The company nearly folded in 2012 after regulators in multiple states accused it of violating a variety of advertising and brokering laws. By mid-2012, TrueCar’s dealer network had fallen from nearly 5,800 to 3,200 franchises. It has since rebuilt its roster and earlier this year claimed nearly 10,500 dealerships, including more than 9,000 franchised dealers. TrueCar faces another dealer lawsuit in federal court in New York. In March, dealers representing more than 100 new-car franchises, sued TrueCar for more than $250 million, claiming they are victims of false advertising and unfair competition. Dealer lawyer Leonard Bellavia of Mineola, N.Y., filed that suit. 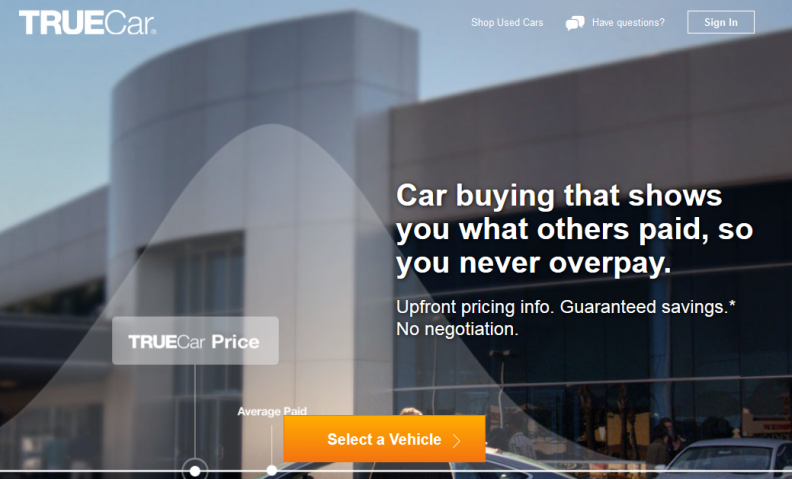 TrueCar is a publicly traded third-party shopping site that enables its shoppers to fetch guaranteed vehicle prices from its certified dealer network. In most states, dealers who sell a vehicle to a TrueCar shopper pay TrueCar $299 for each new vehicle sold and $399 for each used vehicle sold.